CAPE TOWN, South Africa, March 21, 2006 (UPI) — To a standing ovation and great sympathetic applause, Nobel Laureate Nelson Mandela — Madiba as he is known with great affection — slowly and carefully entered the magnificent Ballroom of the venerable Mount Nelson Hotel. Helped by his personal assistant, the frail 88 year old took his seat next to the gracious and elegant Elita de Klerk. They both waved to the crowd of reporters and 250 invited guests. With great dignity, another Nobel Laureate, Archbishop Desmond Tutu, accompanied by South African First Lady Zanele Mbeki, stepped into the room next. Trevor Manuel, the Finance Minister, would follow with anti-apartheid legend Helen Suzman. A troika of billionaire business magnates -Raymond Ackerman, Von Vosloo and Tokyo Sexwale entered one after the other, showing that not only politics had sent its power elite. Zulu Chief Mangosuthu Buthelezi could be seen speaking with H.R.H the Crown Prince of Serbia and Montenegro. Central Bank Governor Tito Mboweni, a former prisoner of the notorious Robben Island, was in conversation with Ambassador David Steward. Not to be topped, Boris Beresovsky, the oligarch in London exile, entered with — well me. And so here they were. Friends and enemies of the past. Former ministers in the apartheid government, with former ANC freedom fighters. European Royals and government ministers. All came for one purpose, to pay tribute to F.W. 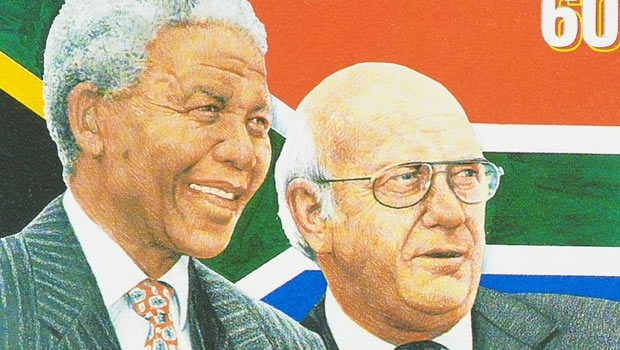 de Klerk, the statesman and Nobel Laureate, the liberator of South Africa, who turned 70. Turning to F.W. de Klerk, the evening’s first speaker, Nelson Mandela, stated in fluent Afrikaans — a great tribute to his former nemesis — “It is good to see us growing old together.” Adding, “of course I still have my hair, even though it’s much greyer. But it wasn’t you who made me grey and I hope it wasn’t me who made you bald.” The room erupted in laughter. Mandela, his voice strong and confident despite his aging body continued in English, “You may gloat that you are 20 years behind me in age. But remember, I spent 30 years idly relaxing on islands and in other resorts, while you were battling it out with the crowds.” This brought the house down. As with many in the room, President de Klerk wiped a tear from his eyes — clearly moved by Mandela’s words. This would be one of many moments during the evening, where the somber de Klerk would show an unusual emotional side of his personality. Mandela did not always acknowledge de Klerk’s role in ending apartheid. But on this evening, he was gracious in his praise. It was all the more noteworthy because of Mandela’s ill health. He now rarely travels from his home in Johannesburg, some 1,000 miles away. One by one, the great and the good paid tribute. During a pause, I decided to take a quiet moment outside. I waved to Boris Beresovksy, who nodded that he would join me outside. I had met Beresovsky some 10 years ago. I did not know him well. We began a discussion on the changes in South Africa and his great admiration for President de Klerk. “It was amazing,” how South Africa had transformed. He wished other world leaders had de Klerk and Mandela’s courage. He especially wished Russia had similar leadership. Russia desperately needed good and strong leadership. Several times during the evening, de Klerk noted to me, and later during his birthday-boy speech, that his jubilee was the brain-child of Elita, his second wife. Greek by birth, she and de Klerk had met towards the end of his presidency. A stunning and dignified lady, Elita de Klerk has quietly played her role in helping South Africa reconciliation. I have rarely seen a man so humbled by the tributes paid to him. On numerous occasions during his speech, De Klerk’s voice broke. It broke, especially as he addressed the serious issues still confronting South Africa. He spoke of civil society, of HIV, of crime, of the need for all to continue working together. “Our work is still not done,” said the man who is one of new-South Africa’s leading ambassadors and advocates. Somewhere during the middle of the evening, I had moved to the table next to mine to say hello to Elita de Klerk. Nervously, I stopped and crouched next to her. She rose to greet me. I hugged her and thanked her. At that exact moment, Nelson Mandela slowly stood. I reached out to help him, taking the arm of this great man. 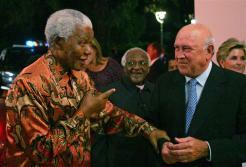 President de Klerk joined from the next table, taking Mandela’s other arm. We slowly walked forward, as I gave up my place to Mandela’s assistant. I had tears in my eyes. This was the new South Africa.